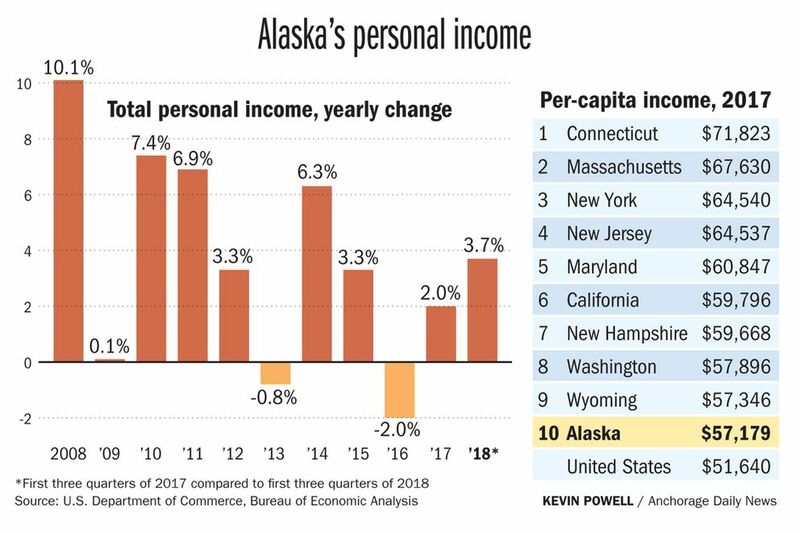 Alaskans’ total income increased the last two years, even as the state continued to lose jobs in the economic downturn. Alaska ranked No. 10 nationally in per capita income in 2017. Data show a 2 percent increase in total personal income in 2017 and 3.7 percent growth in 2018, according to a report from the Alaska Department of Labor and Workforce Development. While that growth “could be a sign of economic recovery" after a 2 percent dip in 2016, the report said, “it likely means other sources of income besides work earnings boosted the numbers." About 65 percent of Alaskans’ total $42.3 billion in 2017 income came from working, about 19 percent was from investments, and the rest came from transfer payments, which include retirement, disability and the Permanent Fund dividend. That makeup is similar to national numbers. The data for 2018 are preliminary, and compared only the first three quarters of that year to the first three quarters of 2017. Year to year in the past decade, total income in Alaska has been “somewhat erratic,” the report said. It grew about 10 percent in 2008 (that was also the year Alaskans got what is now their second biggest Permanent Fund dividend ever, at $2,069, plus the $1,200 resource rebate). Then there was virtually no growth the next year before it spiked again by 7.4 percent in 2010. Alaska ranks No. 10 in the nation in per capita income, at $57,179, based on 2017 figures. At the top of the list were Connecticut, Massachusetts and New York. Mississippi came in last. For the U.S. as a whole, per capita income in 2017 was $51,640. What was once a wide gap between Alaska’s per capita income and the national figure has long been closing, the report said, “mainly due to the shrinking difference in wages between Alaska and the nation as a whole." Alaska’s current recession started in late 2015, and the state has lost about 12,700 jobs, “a disproportionate share” of them in high-wage sectors including oil and gas. Service sector and lower-wage jobs are now a larger part of the state economy, according to the labor department. Alaska’s total income soared in 1976 with the pipeline boom, and it remained high until the massive recession of the mid-1980s. After three straight years of job declines, the state is projected to have slight job growth in 2019, according to the labor department forecast in January.